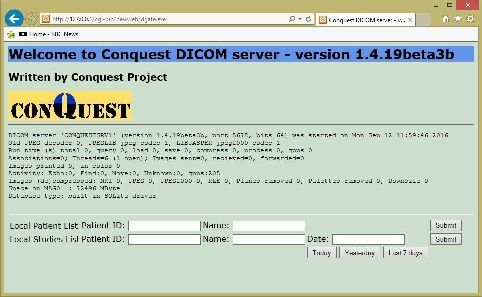 Within the EC Conquest project, a full featured DICOM server has been developed based on and heavily extending the public domain UCDMC DICOM code developed by Mark Oskin when he was at the Medical Center of the University of California at Davis. The Conquest DICOM software was written by Marcel van Herk and Lambert Zijp at the Netherlands Cancer Institute.We have decided to provide our extended DICOM software also to the public domain. It is now maintained by Marcel van Herk at the University of Manchester. Complete DICOM server offering storage, verification, query and retrieve with programmable SQL database tables. This user-programmable feature allows the MicroPACS to be custom tailored to a particular Clinical/Research area. 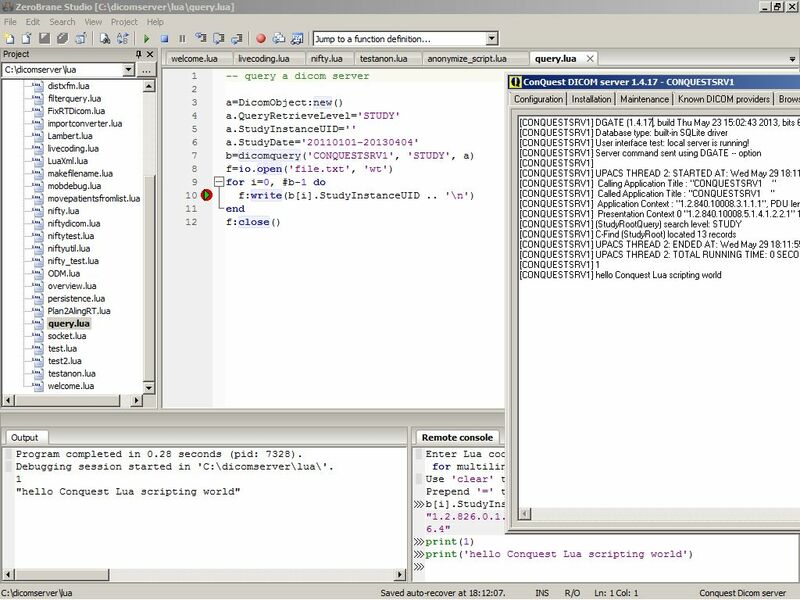 The server supports a wide range of databases with ODBC (Windows) or without (Windows/Linux), including DbaseIII, MySQL, Postgres and SqLite. Fast error free and transparent compression (>2x) of image data on disk with NKI private, JPEG or JPEG2000 compression. 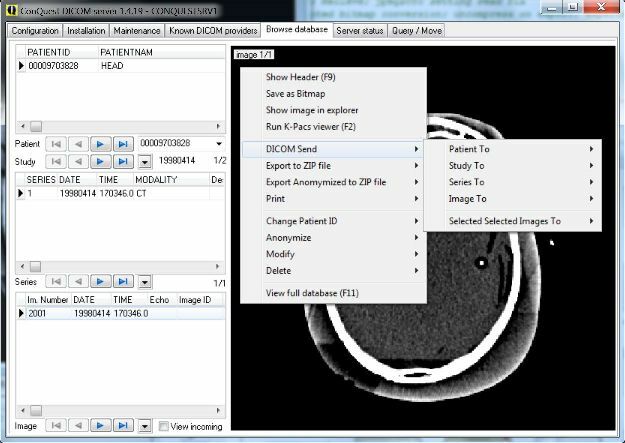 A database browser and slice viewer integrated in the PACS system with options for: viewing DICOM header, creating BMP files (ideal for slides), sending selected images, printing, database fix tools such as changing patient IDs, deleting and anonymizing studies and series, and splitting and merging series. Use drag and drop to load ZIP, DICOM and HL7 files. A simple query/move user interface for diagnostic purposes, to improve your knowledge of DICOM, and to grab missing data from another server. Elementary DICOM print server and client - prints to the default printer. JPEG, JPEG2000 compression and decompression (thanks to Bruce Barton) and RLE decompression supported. Flexible configuration of JPEG and NKI private compression with optional (de)compression of incoming, dropped, transmitted and archived files. 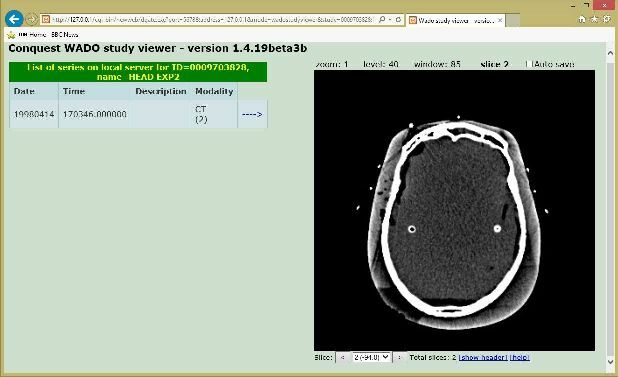 A simple DICOM Modality Worklist implementation with HL7 import with configurable translation. A CGI WEB interface with several possible viewers (also on the Linux version with does not have a GUI). The server can act as an advanced (Lua) scriptable DICOM image forwarder, processor and/or DICOM image cache. Please check first our new FORUM (kindly hosted by the K-PACS team). PACS Research and Development Lab. Copyright (c) 2019 University of Manchester. Developed by Marcel van Herk, Lambert Zijp and Jan Meinders; the Netherlands Cancer Institute; Radiotherapy Department; maintained by Marcel van Herk, University of Manchester. Copyright (c) 1995 Regents of the University of California. All rights reserved. Developed by: Mark Oskin, mhoskin@ucdavis.edu; University of California, Davis Medical Center; Department of Radiology with a Solaris port done and maintained by: Terry Rosenbaum; Michigan State University; Department of Radiology. Redistribution and use in source and binary forms are permitted provided that the above copyright notice and this paragraph are duplicated in all such forms and that any documentation, advertising materials, and other materials related to such distribution and use acknowledge that the software was developed by the University of California, Davis. The name of the University may not be used to endorse or promote products derived from this software without specific prior written permission. THIS SOFTWARE IS PROVIDED ``AS IS'' AND WITHOUT ANY EXPRESS OR IMPLIED WARRANTIES, INCLUDING, WITHOUT LIMITATION, THE IMPLIED WARRANTIES OF MERCHANTIBILITY AND FITNESS FOR A PARTICULAR PURPOSE. Please first check our FORUM (kindly hosted by the K-PACS team).